Does BAS science help to manage krill fishing in the Southern Ocean? Understanding Antarctic marine ecosystems by exploring biodiversity and resilience to environmental change is critical for making the policy decisions necessary for effective stewardship and sustainable management of marine resources. For more than 30 years the British Antarctic Survey’s pioneering conservation biology research has provided critical expertise and evidence to support the UK Government’s leadership role in influencing national and international policies and agreements to protect and conserve marine and terrestrial ecosystems in Antarctica and the sub-Antarctic. Scientific evidence from BAS, as well as from other sources, is used by policy-makers globally, including the UK Government. BAS scientific evidence is also used by the Commission for the Conservation of Antarctic Marine Living Resources (CCAMLR) to sustainably and responsibly manage krill fisheries in the Southern Ocean. What is a sustainable level of fishing? CCAMLR, the international body responsible for managing fisheries in the Southern Ocean, has determined that annual catches of up to 5.6 million tonnes are sustainable across the Antarctic Peninsula, the South Orkneys and South Georgia and the South Sandwich Islands. But, to provide additional protection for krill predators, the catch limit has been set at a much lower level (620,000 tonnes, equivalent to approximately 1% of the estimated krill biomass in these areas). Catches cannot increase beyond this highly precautionary limit until CCAMLR has designed and agreed a management system which spatially subdivides the krill catch so that it does not have adverse impacts upon krill predators. This is a long-term project that requires collaboration and agreement between scientists from many nations, commercial fishers, fishery managers and environmental Non-Governmental Organisations (eNGOs). What level of protection is there over the level of krill fishing at South Georgia? The Government of South Georgia and the South Sandwich Islands (GSGSSI) manages fisheries that are also subject to conservation measures agreed through CCAMLR. This means that annual krill catches cannot exceed 279,000 tonnes at South Georgia or 93,000 tonnes around the South Sandwich Islands. 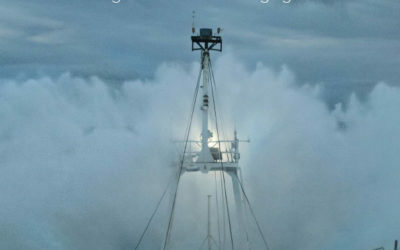 In fact annual catches at South Georgia have been below 80,000 tonnes since 1991 and there has been no krill fishing at the South Sandwich Islands since the mid 1980s. This illustrates two important features of the current krill fishery: demand for krill products is low compared to the available catch limits, and the fishery generally only operates in areas where it has been consistently successful in the past. The GSGSSI often imposes more stringent management provisions than CCAMLR. For example, in February 2012 the GSGSSI implemented a large Marine Protected Area (MPA) around South Georgia and the South Sandwich Islands covering the territorial waters north of 60° south, stretching from the coast out to a distance of 200 nautical miles (nm) (see www.sgisland.gs). New provisions were announced in January 2013 including the extension from three to 12nm of the ‘no-take’ zone around the South Sandwich Islands and the introduction of a seasonal closure of the krill fishery to protect krill predators during the summer breeding season. Krill fishing is now restricted to the winter months, when many of these predators disperse to other waters. 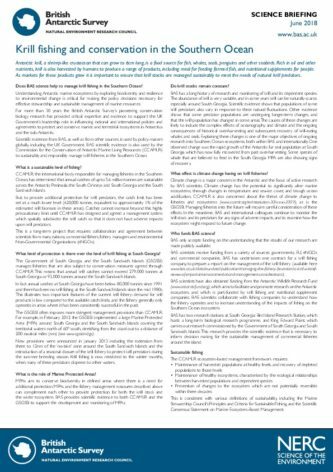 What is the role of Marine Protected Areas? MPAs aim to conserve biodiversity in defined areas where there is a need for additional protection. MPAs and the fishery management measures described above can complement each other to provide protection for both the krill stock and the wider ecosystem. BAS provides scientific evidence to both CCAMLR and the GSGSSI to support the development and monitoring of MPAs. Do krill stocks remain constant? BAS has a long history of research and monitoring of krill and its dependent species. The abundance of krill is very variable, and in some years krill can be naturally scarce, especially around South Georgia. 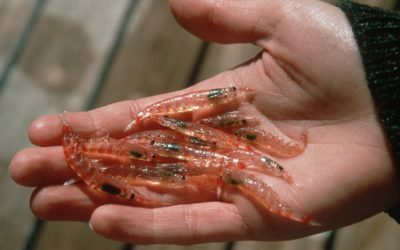 Scientific evidence shows that populations of some krill predators also vary in response to these natural fluctuations. Other evidence shows that some predator populations are undergoing longer-term changes, and that the krill population has changed in some areas. The causes of these changes are likely to include the complex effects of oceanography and climate and the ongoing consequences of historical over-harvesting and subsequent recovery of krill-eating whales and seals. Explaining these changes is one of the major objectives of ongoing research into Southern Ocean ecosystems, both within BAS and internationally. One observed change was the rapid growth of the Antarctic fur seal population at South Georgia which has now fully recovered from past over-harvesting. Some species of whale that are believed to feed in the South Georgia MPA are also showing signs of recovery. What effect is climate change having on krill fisheries? Climate change is a major concern in the Antarctic and the focus of active research by BAS scientists. Climate change has the potential to significantly alter marine ecosystems, through changes in temperature and sea-ice cover, and trough ocean acidification. CCAMLR is also concerned about the threat of climate change to fisheries and ecosystems (www.ccamlr.org/en/resolution-30/xxviii-2009), as is the GSGSSI. Managing fisheries into the future will require careful consideration of these effects. In the meantime, BAS and international colleagues continue to monitor the krill stock and its predators for any signs of adverse impacts, and to examine how the ecosystem might respond to future change. BAS only accepts funding on the understanding that the results of our research are made publicly available. BAS scientists receive funding from a variety of sources: governments, EU, eNGOs and commercial companies. BAS has undertaken one contract for a krill fishing company, to prepare a report on the management of the krill fishery (available here www.bas.ac.uk/data/our-data/publication/managing-the-fishery-for-antarctic-krill-a-brief-review-of-important-environmental-and-management-considerations). BAS scientists have also obtained funding from the Antarctic Wildlife Research Fund (www.antarcticfund.org), which aims to facilitate and promote research on the Antarctic ecosystem, and which is part-funded by krill fishing and nutritional supplement companies. BAS scientists collaborate with fishing companies to understand how the fishery operates and to increase understanding of the impacts of fishing on the Southern Ocean ecosystem. BAS has two research stations at South Georgia: Bird Island Research Station, which hosts a long-term biological research programme, and King Edward Point, which carries out research commissioned by the Government of South Georgia and South Sandwich Islands. This research provides the scientific evidence that is necessary to inform decision making for the sustainable management of commercial fisheries around the island. This is consistent with various definitions of sustainability, including the Marine Stewardship Council’s Principles and Criteria for Sustainable Fishing, and the Scientific Consensus Statement on Marine Ecosystem-Based Management.